Setting itself up as a low priced alternative to the many high priced full sized telescopes on the market, this is one Orion telescope that has a lot of ambition in its portable shell. Designed for beginners, it has the capabilities to be useful to intermediate users. For those in a higher tier it is still functional as a backup, making it one of the lowest cost solutions on the market that appeals to several levels. Orion didn’t get shy on the accessories and there are a bunch to go around, so expect this to get a lot of use before you have to go out and replace it with an uber telescope. The style is pretty much set as one, but is a very attractive green with black. The green is kind of shiny, giving way to the illusion that this is anything more than a starter scope. Looking at it up close gives a better idea of how nice it is rather than looking at it faraway at night. It’s very consumer level in its design, and can be called about average for knob and button placement. There are some things they could have done differently with the tripod as well, but it is nothing that takes away from the value of the telescope. As this is a starter kit then it is better used by beginners and hobbyists, but it is decent enough that an intermediate user would love to get their hands on it. There are some limitations that may aggravate intermediate users, but nothing that you shouldn’t expect from a telescope in this low of a price range. There are more than a dozen different configurations to play around with, so it does have a learning curve that comes into play later on. But if moving on to another brand besides Orion when you upgrade your telescope, then you may find that you have to relearn certain functions all over again. Like many telescopes in this price range the Orion won’t blow you away with its durability, and that can be figured out with how light both the telescope and the tripod are together. This is one product that won’t instill you with a lot of confidence if it drops onto something hard. Buying a bag is recommended, but if you’re the careful type then it will do just fine on its own merit. The most durable part about the product are the actual lenses, which is a step up from the previous generation and serves as the most important part of this telescope. There are oodles and oodles of extras thrown in, but for the base materials by themselves it is a pretty good deal. The telescope is a 60mm glass refractor that though underpowered is very crisp when you lock onto a target. This is proof that not all lenses are created equally, especially the low powered ones. The scope comes with two fully coated 1.25 eyepieces with multiple magnifications to play around with. Find the view that works best for you and lock on for good rather than playing around with hard to manage settings on lesser telescopes. There are a couple of controls to play around with that can really change the way the telescope is used if you master them. No bag is included, but that is standard for this type of release. But due to the fragility of the materials a small cheap bag would have done a world of good. The tripod that the telescope is on lacks any type of features whatsoever other than the basic tray. This means without slow motion features you may be dead in the water when trying to follow a comet shooting across the sky. The 60mm is pretty and crisp but vastly underpowered for what you can get in the same price range from other competitors. This limits the levels it can be used on consistently, whereas a bump up to 70-90mm would have made it a can’t miss deal. There are a handful of great items in this package starting with the Astronomy book. Besides providing a great introduction for beginners it may serve as a primer for intermediates. Some of the focus shines the light on backyard astronomy which works out perfect for the low power of this scope. It’s a quick and easy way to jump directly in without fiddling with controls that could take you hours. The Orion MoonMap 260 contains all of the important details of the Moon for you to review and find, making it infinitely easier to track down popular spots. And if you plan on putting a lot of use into this telescope, the included Star Target planisphere is a star chart built to let you see what’s in the sky at any time of the day, at any point in the year. These are all handy tools that will work wonders if you are just getting started with stargazing. With all of the included booklets, materials and charts this is about as good a value as you’re going to get for the price. The reading material and charts alone are wort the price of admission, and some of these are useful items even for intermediate users. The biggest takeaway from the value of this product is that without the included materials then this would be considered a slightly overpriced scope. So the extras really do make up the cost of this product, meaning the bulk of the value of this package is going to come when a beginner or hobbyist is using it. There isn’t a lot of lasting appeal with this, since the actual telescope and tripod are pretty average. After going through this for about a year buyers can expect to start looking for an upgrade. If you are just using this for hobby purposes then it’ll be fine for years. Only lower intermediates will be able to take full advantage of all of the materials, as higher level intermediates will find this package a bit underpowered for their tastes. There is still plenty of appeal in it as a secondary scope for intermediates and possibly experts with the right add-ons. 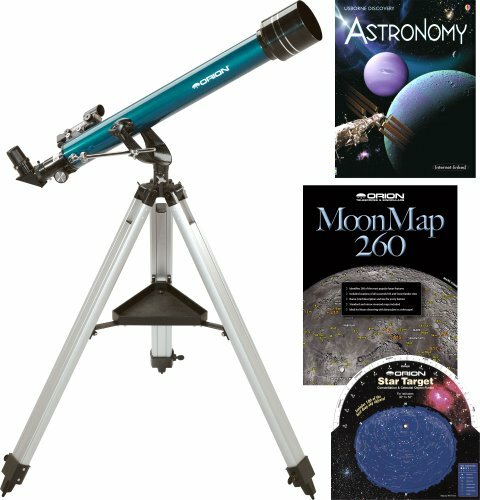 Lacking a lot of the source material but have a superior scope and tripod for the same price is the Orion 10034 GoScope II 70mm Refractor Travel Telescope Moon Kit. The powerful 70mm refractor will make a world of difference and the tripod combo is 10x better than the Observer. And to make matters even better it comes with a backpack! The reason you would choose the Observer over this model is that it lacks all of the education materials and charts. That’s the key difference between the two, and that is why even at the same price the GoScope isn’t a better value for beginners and hobbyists. It’s not often that average products get a boost from their many extras, but that is the case with this model. The extras really save this from being a bad buy, so much so that it comes recommended. You’re not going to get a better starter kit for this same low price.